We also recommend you to try and answer all exams on our NCLEX page! EXAM TIP: Do your weekly calendar by noting when you will do, what, and how. When-what-how is necessary to schedule. Critique how each day went by what you acquired and review what you could improve. In Exam Mode: All questions are shown but the results, answers, and rationales (if any) will only be given after you’ve finished the quiz. You are given 1 minute per question. Flumazenil (Romazicon) has been ordered for a client who has overdosed on oxazepam (Serax). Before administering the medication, the nurse should be prepared for which common adverse effect? Option A: Seizures are the most common serious adverse effect of using flumazenil to reverse benzodiazepine overdose. The effect is magnified if the client has a combined tricyclic antidepressant and benzodiazepine overdose. Options B, C, and D: Less common adverse effects include shivering, anxiety, and chest pain. avoid shopping for large amounts of food. eat only three meals per day. Option C: Bulimic behavior is generally a maladaptive coping response to stress and underlying issues. The client must identify anxiety-causing situations that stimulate the bulimic behavior and then learn new ways of coping with the anxiety. Option A: Controlling shopping for large amounts of food isn’t a goal early in treatment. Option B: Managing eating impulses and replacing them with adaptive coping mechanisms can be integrated into the plan of care after initially addressing stress and underlying issues. Option D: Eating three meals per day isn’t a realistic goal early in treatment. check the client frequently at irregular intervals throughout the night. assure the client that the nurse will hold in confidence anything the client says. repeatedly discuss previous suicide attempts with the client. disregard decreased communication by the client because this is common in suicidal clients. Option A: Checking the client frequently but at irregular intervals prevents the client from predicting when observation will take place and altering behavior in a misleading way at these times. Option B: May encourage the client to try to manipulate the nurse or seek attention for having a secret suicide plan. Option C: May reinforce suicidal ideas. Option D: Decreased communication is a sign of withdrawal that may indicate the client has decided to commit suicide; the nurse shouldn’t disregard it. Which of the following drugs should the nurse prepare to administer to a client with a toxic acetaminophen (Tylenol) level? Option D: The antidote for acetaminophen toxicity is acetylcysteine. It enhances conversion of toxic metabolites to nontoxic metabolites. Option A: Deferoxamine mesylate is the antidote for iron intoxication. Option B: Succimer is an antidote for lead poisoning. Option C: Flumazenil reverses the sedative effects of benzodiazepines. A client is admitted to the substance abuse unit for alcohol detoxification. Which of the following medications is the nurse most likely to administer to reduce the symptoms of alcohol withdrawal? Option D: Chlordiazepoxide (Librium) and other tranquilizers help reduce the symptoms of alcohol withdrawal. Option A: Naloxone (Narcan) is administered for narcotic overdose. Option B: Haloperidol (Haldol) may be given to treat clients with psychosis, severe agitation, or delirium. Option C: Magnesium sulfate and other anticonvulsant medications are only administered to treat seizures if they occur during withdrawal. During postprandial monitoring, a client with bulimia nervosa tells the nurse, “You can sit with me, but you’re just wasting your time. After you sat with me yesterday, I was still able to purge. Today, my goal is to do it twice.” What is the nurse’s best response? Option D: This response acknowledges that the client is testing limits and that the nurse is setting them by performing postprandial monitoring to prevent self-induced emesis. Clients with bulimia nervosa need to feel in control of the diet because they feel they lack control over all other aspects of their lives. Option A: Because their therapeutic relationships with caregivers are less important than their need to purge, they don’t fear betraying the nurse’s trust by engaging in the activity. Option B: They commonly plot to purge and rarely share their secrets about it. Option C: An authoritarian or challenging response may trigger a power struggle between the nurse and client. A client admitted to the psychiatric unit for treatment of substance abuse says to the nurse, “It felt so wonderful to get high.” Which of the following is the most appropriate response? Option B: Confronting the client with the consequences of substance abuse helps to break through denial. Option A: Making threats isn’t an effective way to promote self-disclosure or establish a rapport with the client. Option C: Although the nurse should encourage the client to discuss feelings, the discussion should focus on how the client felt before, not during, an episode of substance abuse. Encouraging elaboration about his experience while getting high may reinforce the abusive behavior. Option D: The client undoubtedly is aware that drug use is illegal; a reminder to this effect is unlikely to alter behavior. For a client with anorexia nervosa, which goal takes the highest priority? The client will establish adequate daily nutritional intake. The client will make a contract with the nurse that sets a target weight. The client will identify self-perceptions about body size as unrealistic. The client will verbalize the possible physiological consequences of self-starvation. Option A: According to Maslow’s hierarchy of needs, all humans need to meet basic physiological needs first. Because a client with anorexia nervosa eats little or nothing, the nurse must first plan to help the client meet this basic, immediate physiological need. Options B, C, and D: The nurse may give lesser priority to goals that address long-term plans, self-perception, and potential complications. When interviewing the parents of an injured child, which of the following is the strongest indicator that child abuse may be a problem? The injury isn’t consistent with the history or the child’s age. The mother and father tell different stories regarding what happened. The parents are argumentative and demanding with emergency department personnel. Option A: When the child’s injuries are inconsistent with the history given or impossible because of the child’s age and developmental stage, the emergency department nurse should be suspicious that child abuse is occurring. Option B: The parents may tell different stories because their perception may be different regarding what happened. If they change their story when different healthcare workers ask the same question, this is a clue that child abuse may be a problem. Option C: Child abuse occurs in all socioeconomic groups. Option D: Parents may argue and be demanding because of the stress of having an injured child. For a client with anorexia nervosa, the nurse plans to include the parents in therapy sessions along with the client. What fact should the nurse remember to be typical of parents of clients with anorexia nervosa? They tend to overprotect their children. They usually have a history of substance abuse. They maintain emotional distance from their children. They alternate between loving and rejecting their children. Option A: Clients with anorexia nervosa typically come from a family with parents who are controlling and overprotective. These clients use eating to gain control of an aspect of their lives. Options B, C, and D: The characteristics described in options B, C, and D aren’t typical of parents of children with anorexia. In the emergency department, a client with facial lacerations states that her husband beat her with a shoe. After the health care team repairs her lacerations, she waits to be seen by the crisis intake nurse, who will evaluate the continued threat of violence. Suddenly the client’s husband arrives, shouting that he wants to “finish the job.” What is the first priority of the health care worker who witnesses this scene? Option B: The first priority is to call a security guard and another staff member. After doing this, the healthcare worker should inform the husband what is expected, speaking in concise statements and maintaining a firm but calm demeanor. This approach makes it clear that the healthcare worker is in control and may diffuse the situation until the security guard arrives. Option A: The healthcare worker who witnesses this scene must take precautions to ensure personal as well as client safety, but shouldn’t attempt to manage a physically aggressive person alone. Option C: Telling the husband to leave would probably be ineffective because of his agitated and irrational state. Option D: Exploring his anger doesn’t take precedence over safeguarding the client and staff. The nurse is caring for a client with bulimia. Strict management of dietary intake is necessary. Which intervention is also important? Fill out the client’s menu and make sure she eats at least half of what is on her tray. Let the client eat her meals in private. Then engage her in social activities for at least 2 hours after each meal. Let the client choose her own food. If she eats everything she orders, then stay with her for 1 hour after each meal. Let the client eat food brought in by the family if she chooses, but she should keep a strict calorie count. Option C: Allowing the client to select her own food from the menu will help her feel some sense of control. Option A: She must then eat 100% of what she selected. Option B: Remaining with the client for at least 1 hour after eating will prevent purging. Option D: Bulimic clients should only be allowed to eat food provided by the dietary department. The nurse is assigned to care for a suicidal client. Initially, which is the nurse’s highest care priority? 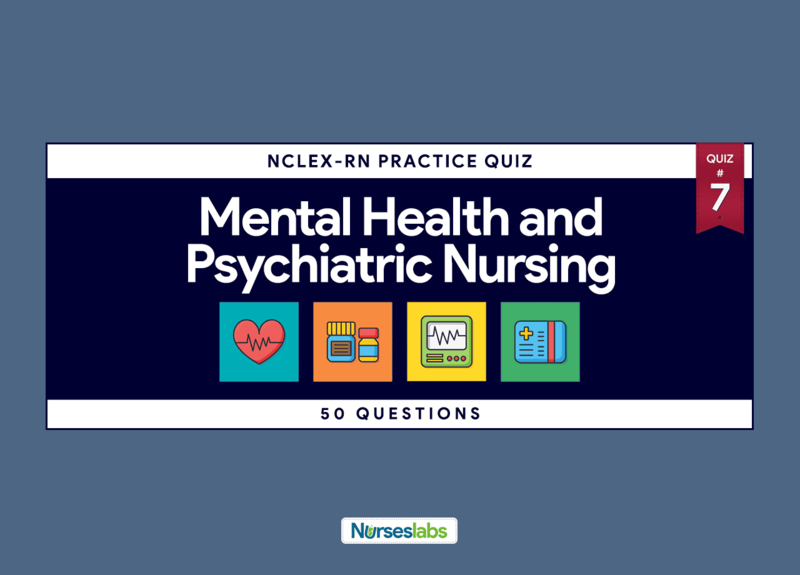 Option B: The nurse’s values, beliefs, and attitudes toward self-destructive behavior influence responses to a suicidal client; such responses set the overall mood for the nurse-client relationship. Therefore, the nurse initially must explore personal feelings about suicide to avoid conveying negative feelings to the client. Option A: Assessment of the client’s home environment and relationships may reveal the need for family therapy; however, conducting such an assessment isn’t a nursing priority. Option C: Discussing the future and providing anticipatory guidance can help the client prepare for future stress, but this isn’t a priority. Option D: Referring the client to a clergyperson may increase the client’s trust or alleviate guilt; however, it isn’t the highest priority. A client with anorexia nervosa tells the nurse, “When I look in the mirror, I hate what I see. I look so fat and ugly.” Which strategy should the nurse use to deal with the client’s distorted perceptions and feelings? Avoid discussing the client’s perceptions and feelings. Focus discussions on food and weight. Avoid discussing unrealistic cultural standards regarding weight. Provide objective data and feedback regarding the client’s weight and attractiveness. Option D: By focusing on reality, this strategy may help the client develop a more realistic body image and gain self-esteem. Option A: Inappropriate because discussing the client’s perceptions and feeling wouldn’t help her to identify, accept, and work through them. Option B: Focusing discussions on food and weight would give the client attention for not eating, making option B incorrect. Option C: Inappropriate because recognizing unrealistic cultural standards wouldn’t help the client establish more realistic weight goals. The nurse is caring for a client being treated for alcoholism. Before initiating therapy with disulfiram (Antabuse), the nurse teaches the client that he must read labels carefully on which of the following products? Option B: Disulfiram may be given to clients with chronic alcohol abuse who wish to curb impulse drinking. Disulfiram works by blocking the oxidation of alcohol, inhibiting the conversion of acetaldehyde to acetate. As acetaldehyde builds up in the blood, the client experiences noxious and uncomfortable symptoms. Even alcohol rubbed onto the skin can produce a reaction. The client receiving disulfiram must be taught to read ingredient labels carefully to avoid products containing alcohol such as aftershave lotions. Options A, C, and D: Carbonated beverages, toothpaste, and cheese don’t contain alcohol and don’t need to be avoided by the client. Restrict visits with the family until the client begins to eat. Set up a strict eating plan for the client. Encourage the client to exercise, which will reduce her anxiety. Option C: Establishing a consistent eating plan and monitoring the client’s weight are important for this disorder. Option A: The family should be included in the client’s care. Option B: The client should be monitored during meals — not given privacy. Option D: Exercise must be limited and supervised. Victims of domestic violence should be assessed for what important information? Option B: Victims of domestic violence must be assessed for their readiness to leave the perpetrator and their knowledge of the resources available to them. Nurses can then provide the victims with information and options to enable them to leave when they are ready. Option A: The reasons they stay in the relationship are complex and can be explored at a later time. Option C: The use of drugs or alcohol is irrelevant. Option D: There is no evidence to suggest that previous victimization results in a person’s seeking or causing abusive relationships. Option B: Numbness and tingling in the hands and feet are symptoms of peripheral polyneuritis, which results from inadequate intake of vitamin B1 (thiamine) secondary to prolonged and excessive alcohol intake. Treatment includes reducing alcohol intake, correcting nutritional deficiencies through diet and vitamin supplements, and preventing such residual disabilities as foot and wrist drop. Options A, C, and D: Acetate accumulation, triglyceride buildup, and a below-normal serum potassium level are unrelated to the client’s symptoms. A parent brings a preschooler to the emergency department for treatment of a dislocated shoulder, which allegedly happened when the child fell down the stairs. Which action should make the nurse suspect that the child was abused? The child cries uncontrollably throughout the examination. The child pulls away from contact with the physician. The child doesn’t cry when the shoulder is examined. The child doesn’t make eye contact with the nurse. Option C: A characteristic behavior of abused children is lack of crying when they undergo a painful procedure or are examined by a healthcare professional. Therefore, the nurse should suspect child abuse. Options A, B, and D: Crying throughout the examination, pulling away from the physician, and not making eye contact with the nurse are normal behaviors for preschoolers. When planning care for a client who has ingested phencyclidine (PCP), which of the following is the highest priority? Option B: The highest priority for a client who has ingested PCP is meeting safety needs of the client as well as the staff. Drug effects are unpredictable and prolonged, and the client may lose control easily. Options A, C, and D: After safety needs have been met, the client’s physical, psychosocial, and medical needs can be met. Accept responsibility for own behaviors. Be able to verbalize own needs and assert rights. Set firm and consistent limits with the client. Allow the child to establish his own limits and boundaries. Option A: Children with oppositional defiant disorder frequently violate the rights of others. They are defiant, disobedient, and blame others for their actions. Accountability for their actions would demonstrate progress for the oppositional child. Option B: This is incorrect as the oppositional child usually focuses on his own needs. Options C and D: These aren’t outcome criteria but interventions. A client is found sitting on the floor of the bathroom in the day treatment clinic with moderate lacerations on both wrists. Surrounded by broken glass, she sits staring blankly at her bleeding wrists while staff members call for an ambulance. How should the nurse approach her initially? Enter the room quietly and move beside her to assess her injuries. Call for staff back-up before entering the room and restraining her. Move as much glass away from her as possible and sit next to her quietly. Approach her slowly while speaking in a calm voice, calling her name, and telling her that the nurse is here to help her. Option D: Ensuring the safety of the client and the nurse is the priority at this time. Therefore, the nurse should approach the client cautiously while calling her name and talking to her in a calm, confident manner. The nurse should keep in mind that the client shouldn’t be startled or overwhelmed. After explaining that the nurse is there to help, the nurse should observe the client’s response carefully. Option B: If the client shows signs of agitation or confusion or poses a threat, the nurse should retreat and request assistance. Option A: The nurse shouldn’t attempt to sit next to the client or examine injuries without first announcing the nurse’s presence and assessing the dangers of the situation. A client with anorexia nervosa describes herself as “a whale.” However, the nurse’s assessment reveals that the client is 5′ 8″ (1.7 m) tall and weighs only 90 lb (40.8 kg). Considering the client’s unrealistic body image, which intervention should be included in the plan of care? Option D: A client with anorexia nervosa has an unrealistic body image that causes consumption of little or no food. Therefore, the client needs assistance with making decisions about health. Options A, B, and C: Instead of protecting the client’s health, options A, B, and C may serve to make the client defensive and more entrenched in her unrealistic body image. Option B: The client’s vital signs and hallucinations suggest delirium tremens or alcohol withdrawal syndrome. Options A, C, and D: Although infection, acute sepsis, and pneumonia may arise as postoperative complications, they wouldn’t cause this client’s signs and symptoms and typically would occur later in the postoperative course. Option C: Clonidine is used as adjunctive therapy in opiate withdrawal. Option A: Benzodiazepines and neuroleptic agents are typically used to treat PCP intoxication. Option B: Benzodiazepines, such as chlordiazepoxide (Librium), and neuroleptic agents, such as haloperidol, are used to treat alcohol withdrawal. Option D: Antidepressants and medications with dopaminergic activity in the brain, such as fluoxetine (Prozac), are used to treat cocaine withdrawal. One of the goals for a client with anorexia nervosa is that the client will demonstrate increased individual coping by responding to stress in constructive ways. Which of the following actions is the best indicator that the client is working toward meeting the goal? The client drinks 4 L of fluid per day. The client paces around the unit most of the day. The client keeps a journal and discusses it with the nurse. The client talks almost constantly with friends by telephone. Option C: The client is moving toward meeting the goal because recording and discussing feelings is a constructive way to manage stress. Option A: Increased fluid intake may be an attempt by the client to curb her appetite and artificially increase her weight. Option B: Although physical activity can reduce stress, the anorexic client is more likely to use pacing to burn calories and lose weight. Option D: Although talks with friends can decrease stress, constant talking is more likely a way of avoiding dealing with problems. Option C: The first of the “Twelve Steps of Alcoholics Anonymous” is admitting that an individual is powerless over alcohol and that life has become unmanageable. Option A: Although Alcoholics Anonymous promotes total abstinence, a client will still be accepted if he drinks. Option B: A physician referral isn’t necessary to join. Option D: New members are assigned a support person who may be called upon when the client has the urge to drink. An attorney who throws books and furniture around the office after losing a case is referred to the psychiatric nurse in the law firm’s employee assistance program. The nurse knows that the client’s behavior most likely represents the use of which defense mechanism? Option A: An adult who throws temper tantrums, such as this one, is displaying regressive behavior, or behavior that is appropriate at a younger age. Option B: In projection, the client blames someone or something other than the source. Option C: In reaction formation, the client acts in opposition to his feelings. Option D: In intellectualization, the client overuses rational explanations or abstract thinking to decrease the significance of a feeling or event. After completing chemical detoxification and a 12-step program to treat crack addiction, a client is being prepared for discharge. Which remark by the client indicates a realistic view of the future? Option C: Twelve-step programs focus on recovery 1 day at a time. Option A: Such programs discourage people from claiming that they will never again use a substance because relapse is common. Option B: The belief that one may use a limited amount of an abused substance indicates denial. Option D: Substituting one abused substance for another predisposes the client to cross-addiction. accurately describe the amount consumed. deny any consumption of alcohol. Option B: Most people who abuse substances underestimate their consumption in an attempt to conform to social norms or protect themselves. Options A, C, and D: Few accurately describe or overestimate consumption; some may deny it. Therefore, on admission, quantitative and qualitative toxicology screens are done to validate information obtained from the client. The nurse is assessing a 15-year-old female who’s being admitted for treatment of anorexia nervosa. Which clinical manifestation is the nurse most likely to find? Option D: Perceptual disorders, especially frightening visual hallucinations, are very common with alcohol withdrawal. Option A: Coma isn’t an immediate consequence. Option B: Manipulative behaviors are part of the alcoholic client’s personality but aren’t signs of alcohol withdrawal. Option C: Suppression is a conscious effort to conceal unacceptable thoughts, feelings, impulses, or acts and serves as a coping mechanism for most alcoholics. The nurse is caring for an adolescent female who reports amenorrhea, weight loss, and depression. Which additional assessment finding would suggest that the woman has an eating disorder? Option D: A client with an eating disorder will normally exercise to excess in an effort to burn as many calories as possible. Option A: The client will usually wear loose-fitting clothing to hide what she considers to be a fat body. Options B and C: Skin and nails become dry and brittle and blood pressure and body temperature drop from excessive weight loss. A client with a history of polysubstance abuse is admitted to the facility. She complains of nausea and vomiting 24 hours after admission. The nurse assesses the client and notes piloerection, pupillary dilation, and lacrimation. The nurse suspects that the client is going through which of the following withdrawals? Option D: The symptoms listed are specific to opioid withdrawal. Option A: Alcohol withdrawal would show elevated vital signs. Option B: There is no real withdrawal from cannabis. Option C: Symptoms of cocaine withdrawal include depression, anxiety, and agitation. A client is admitted to the psychiatric unit with a diagnosis of anorexia nervosa. Although she is 5′ 8″ (1.7 m) tall and weighs only 103 lb (46.7 kg), she talks incessantly about how fat she is. Which measure should the nurse take first when caring for this client? Teach the client about nutrition, calories, and a balanced diet. Establish a trusting relationship with the client. Discuss cultural stereotypes regarding thinness and attractiveness. Explore the reasons why the client doesn’t eat. Option B: A client with an eating disorder may be secretive and unwilling to admit that a problem exists. Therefore, the nurse first must establish a trusting relationship to elicit the client’s feelings and thoughts. Option A: The anorexic client may spend long hours discussing nutrition or handling and preparing food in an effort to stall or avoid eating food; the nurse shouldn’t reinforce her preoccupation with food. Option C: Although cultural stereotypes may play a prominent role in anorexia nervosa, discussing these factors isn’t the first action the nurse should take. Option D: Exploring the reasons why the client doesn’t eat would increase her emotional investment in food and eating. Option A: An amphetamine is a nervous system stimulant that is subject to abuse because of its ability to produce wakefulness and euphoria. An overdose increases tension and irritability. Options B and C: These are incorrect because amphetamines stimulate norepinephrine, which increases the heart rate and blood flow. Option D: Diarrhea is a common adverse effect, so option D is incorrect. Which of the following drugs may be abused because of tolerance and physiologic dependence. Option C: Both benzodiazepines, such as alprazolam, and barbiturates, such as phenobarbital, are addictive, controlled substances. Options A, B, and D: All the other drugs listed aren’t addictive substances. Which of the following groups are considered to be at highest risk for suicide? Option A: Studies of those who commit suicide reveal the following high-risk groups: adolescents; men over age 45; persons who have made previous suicide attempts. Although more women attempt suicide than men, they typically choose less lethal means and therefore are less likely to succeed in their attempts. Options B, C, and D: Divorced, widowed, and separated persons; professionals, such as physicians, dentists, and attorneys; students; unemployed persons; persons who are depressed, delusional, or hallucinating; alcohol or substance abusers; and persons who live in urban areas are also at risk. unpredictable behavior and intense interpersonal relationships. inability to function as a responsible parent. coldness, detachment, and lack of tender feelings. Option A: A client with borderline personality disorder displays a pervasive pattern of unpredictable behavior, mood, and self-image. Interpersonal relationships may be intense and unstable and behavior may be inappropriate and impulsive. Option B: Although the client’s impaired ability to form relationships may affect parenting skills, inability to function as a responsible parent is more typical of antisocial personality disorder. Option C: Somatic symptoms characterize avoidant personality disorder. Option D: Coldness, detachment, and lack of tender feelings typify schizoid and schizotypal personality disorders. A client with disorganized type schizophrenia has been hospitalized for the past 2 years on a unit for chronic mentally ill clients. The client’s behavior is labile and fluctuates from childishness and incoherence to loud yelling to slow but appropriate interaction. The client needs assistance with all activities of daily living. Which behavior is characteristic of disorganized type schizophrenia? Option A: Disorganized-type schizophrenia (formerly called hebephrenia) is characterized by extreme social impairment, marked inappropriate affect, silliness, grimacing, posturing, and fragmented delusions and hallucinations. Option B: A client with a paranoid disorder typically exhibits suspicious delusions, such as a belief that evil forces are after him. Option C: Waxy flexibility, a condition in which the client’s limbs remain fixed in uncomfortable positions for long periods, characterizes catatonic schizophrenia. Option D: Elevated affect is associated with schizoaffective disorder. The nurse is providing care for a female client with a history of schizophrenia who’s experiencing hallucinations. The physician orders 200 mg of haloperidol (Haldol) orally or I.M. every 4 hours as needed. What is the nurse’s best action? Administer the haloperidol orally if the client agrees to take it. Call the physician to clarify whether the haloperidol should be given orally or I.M. Call the physician to clarify the order because the dosage is too high. Withhold haloperidol because it may worsen hallucinations. Option C: The dosage is too high (normal dosage ranges from 5 to 10 mg daily). Options A and B: May lead to an overdose. Option D: This is incorrect because haloperidol helps with symptoms of hallucinations. reassure the client and administer as needed lorazepam (Ativan) I.M. administer as needed dose of benztropine (Cogentin) I.M. as ordered. administer as needed dose of benztropine (Cogentin) by mouth as ordered. administer as needed dose of haloperidol (Haldol) by mouth. Option B: The client is most likely suffering from muscle rigidity due to haloperidol. I.M. benztropine should be administered to prevent asphyxia or aspiration. Option A: Lorazepam treats anxiety, not extrapyramidal effects. Another dose of haloperidol would increase the severity of the reaction. explore the content of the hallucinations. tell him his fear is unrealistic. engage the client in reality-oriented activities. Option B: Exploring the content of the hallucinations will help the nurse understand the client’s perspective on the situation. Option A: The client shouldn’t be touched, such as in taking vital signs, without telling him exactly what is going to happen. Option C: Debating with the client about his emotions isn’t therapeutic. Option D: When the client is calm, engage him in reality-based activities. Which medication can control the extrapyramidal effects associated with antipsychotic agents? Option C: Amantadine is an anticholinergic drug used to relieve drug-induced extrapyramidal adverse effects, such as muscle weakness, involuntary muscle movement, pseudo-parkinsonism, and tardive dyskinesia. Other anticholinergic agents used to control extrapyramidal reactions include benztropine mesylate (Cogentin), trihexyphenidyl (Artane), biperiden (Akineton), and diphenhydramine (Benadryl). Options A, B, and D: Perphenazine is an antipsychotic agent; doxepin, an antidepressant; and clorazepate, an antianxiety agent. Because these medications have no anticholinergic or neurotransmitter effects, they don’t alleviate extrapyramidal reactions. take an as-needed dose of psychotropic medication whenever they hear voices. practice saying “Go away” or “Stop” when they hear voices. sing loudly to drown out the voices and provide a distraction. go to their room until the voices go away. Option B: Researchers have found that some clients can learn to control bothersome hallucinations by telling the voices to go away or stop. Option A: Taking an as needed dose of psychotropic medication whenever the voices arise may lead to overmedication and put the client at risk for adverse effects. Because the voices aren’t likely to go away permanently, the client must learn to deal with the hallucinations without relying on drugs. Option C: Although distraction is helpful, singing loudly may upset other clients and would be socially unacceptable after the client is discharged. Option D: Hallucinations are most bothersome in a quiet environment when the client is alone, so sending the client to his room would increase, rather than decrease, the hallucinations. A dystonic reaction can be caused by which of the following medications? Option B: Haloperidol is a phenothiazine and is capable of causing dystonic reactions. Options A and D: Diazepam and clonazepam are benzodiazepines, and amitriptyline is a tricyclic antidepressant. Benzodiazepines don’t cause dystonic reactions; however, they can cause drowsiness, lethargy, and hypotension. Option C: Tricyclic antidepressants rarely cause severe dystonic reactions; however, they can cause a decreased level of consciousness, tachycardia, dry mouth, and dilated pupils. While pacing in the hall, a client with paranoid schizophrenia runs to the nurse and says, “Why are you poisoning me? I know you work for central thought control! You can keep my thoughts. Give me back my soul!” How should the nurse respond during the early stage of the therapeutic process? Option B: The nurse should directly orient a delusional client to reality, especially to place and person. Options A and C: These may encourage further delusions by denying poisoning and offering information related to the delusion. Option D: Validating the client’s feelings occurs during a later stage in the therapeutic process. A client is admitted to the inpatient unit of the mental health center with a diagnosis of paranoid schizophrenia. He’s shouting that the government of France is trying to assassinate him. Which of the following responses is most appropriate? Option B: Responses should focus on reality while acknowledging the client’s feelings. Option A: Arguing with the client or denying his belief isn’t therapeutic. Option C: Arguing can also inhibit the development of a trusting relationship. Continuing to talk about delusions may aggravate the psychosis. Option D: Asking the client if a foreign government is trying to kill him may increase his anxiety level and can reinforce his delusions. sit in a quiet, dark room and concentrate on the voices. listen to a personal stereo through headphones and sing along with the music. call a friend and discuss the voices and his feelings about them. Option B: Increasing the amount of auditory stimulation, such as by listening to music through headphones, may make it easier for the client to focus on external sounds and ignore internal sounds from auditory hallucinations. Option A: This would make it harder for the client to ignore the hallucinations. Option C: Talking about the voices would encourage the client to focus on them. Option D: This is incorrect because exercise alone wouldn’t provide enough auditory stimulation to drown out the voices. 1. Flumazenil (Romazicon) has been ordered for a client who has overdosed on oxazepam (Serax). Before administering the medication, the nurse should be prepared for which common adverse effect? 4. Which of the following drugs should the nurse prepare to administer to a client with a toxic acetaminophen (Tylenol) level? 5. A client is admitted to the substance abuse unit for alcohol detoxification. Which of the following medications is the nurse most likely to administer to reduce the symptoms of alcohol withdrawal? 6. During postprandial monitoring, a client with bulimia nervosa tells the nurse, “You can sit with me, but you’re just wasting your time. After you sat with me yesterday, I was still able to purge. Today, my goal is to do it twice.” What is the nurse’s best response? 7. A client admitted to the psychiatric unit for treatment of substance abuse says to the nurse, “It felt so wonderful to get high.” Which of the following is the most appropriate response? 8. For a client with anorexia nervosa, which goal takes the highest priority? 9. When interviewing the parents of an injured child, which of the following is the strongest indicator that child abuse may be a problem? A. The injury isn’t consistent with the history or the child’s age. 10. For a client with anorexia nervosa, the nurse plans to include the parents in therapy sessions along with the client. What fact should the nurse remember to be typical of parents of clients with anorexia nervosa? 11. In the emergency department, a client with facial lacerations states that her husband beat her with a shoe. After the health care team repairs her lacerations, she waits to be seen by the crisis intake nurse, who will evaluate the continued threat of violence. Suddenly the client’s husband arrives, shouting that he wants to “finish the job.” What is the first priority of the health care worker who witnesses this scene? 12. The nurse is caring for a client with bulimia. Strict management of dietary intake is necessary. Which intervention is also important? A. Fill out the client’s menu and make sure she eats at least half of what is on her tray. 13. The nurse is assigned to care for a suicidal client. Initially, which is the nurse’s highest care priority? 14. A client with anorexia nervosa tells the nurse, “When I look in the mirror, I hate what I see. I look so fat and ugly.” Which strategy should the nurse use to deal with the client’s distorted perceptions and feelings? A. Avoid discussing the client’s perceptions and feelings. D. Provide objective data and feedback regarding the client’s weight and attractiveness. 15. The nurse is caring for a client being treated for alcoholism. Before initiating therapy with disulfiram (Antabuse), the nurse teaches the client that he must read labels carefully on which of the following products? 16. The nurse is developing a plan of care for a client with anorexia nervosa. Which action should the nurse include in the plan? 17. Victims of domestic violence should be assessed for what important information? 19. A parent brings a preschooler to the emergency department for treatment of a dislocated shoulder, which allegedly happened when the child fell down the stairs. Which action should make the nurse suspect that the child was abused? C. The child doesn’t cry when the shoulder is examined. D. The child doesn’t make eye contact with the nurse. 20. When planning care for a client who has ingested phencyclidine (PCP), which of the following is the highest priority? 21. Which outcome criteria would be appropriate for a child diagnosed with oppositional defiant disorder? 22. A client is found sitting on the floor of the bathroom in the day treatment clinic with moderate lacerations on both wrists. Surrounded by broken glass, she sits staring blankly at her bleeding wrists while staff members call for an ambulance. How should the nurse approach her initially? 23. A client with anorexia nervosa describes herself as “a whale.” However, the nurse’s assessment reveals that the client is 5′ 8″ (1.7 m) tall and weighs only 90 lb (40.8 kg). Considering the client’s unrealistic body image, which intervention should be included in the plan of care? 25. Clonidine (Catapres) can be used to treat conditions other than hypertension. For which of the following conditions might the drug be administered? 26. One of the goals for a client with anorexia nervosa is that the client will demonstrate increased individual coping by responding to stress in constructive ways. Which of the following actions is the best indicator that the client is working toward meeting the goal? 28. An attorney who throws books and furniture around the office after losing a case is referred to the psychiatric nurse in the law firm’s employee assistance program. The nurse knows that the client’s behavior most likely represents the use of which defense mechanism? 29. After completing chemical detoxification and a 12-step program to treat crack addiction, a client is being prepared for discharge. Which remark by the client indicates a realistic view of the future? 31. The nurse is assessing a 15-year-old female who’s being admitted for treatment of anorexia nervosa. Which clinical manifestation is the nurse most likely to find? 33. The nurse is caring for an adolescent female who reports amenorrhea, weight loss, and depression. Which additional assessment finding would suggest that the woman has an eating disorder? 34. A client with a history of polysubstance abuse is admitted to the facility. She complains of nausea and vomiting 24 hours after admission. The nurse assesses the client and notes piloerection, pupillary dilation, and lacrimation. The nurse suspects that the client is going through which of the following withdrawals? 35. A client is admitted to the psychiatric unit with a diagnosis of anorexia nervosa. Although she is 5′ 8″ (1.7 m) tall and weighs only 103 lb (46.7 kg), she talks incessantly about how fat she is. Which measure should the nurse take first when caring for this client? D. Explore the reasons why the client doesn’t eat. 37. Which of the following drugs may be abused because of tolerance and physiologic dependence. 38. Which of the following groups are considered to be at highest risk for suicide? A. unpredictable behavior and intense interpersonal relationships. B. inability to function as a responsible parent. D. coldness, detachment, and lack of tender feelings. 41. A client with disorganized type schizophrenia has been hospitalized for the past 2 years on a unit for chronic mentally ill clients. The client’s behavior is labile and fluctuates from childishness and incoherence to loud yelling to slow but appropriate interaction. The client needs assistance with all activities of daily living. Which behavior is characteristic of disorganized type schizophrenia? 42. The nurse is providing care for a female client with a history of schizophrenia who’s experiencing hallucinations. The physician orders 200 mg of haloperidol (Haldol) orally or I.M. every 4 hours as needed. What is the nurse’s best action? A. Administer the haloperidol orally if the client agrees to take it. B. Call the physician to clarify whether the haloperidol should be given orally or I.M. C. Call the physician to clarify the order because the dosage is too high. D. Withhold haloperidol because it may worsen hallucinations. A. reassure the client and administer as needed lorazepam (Ativan) I.M. B. administer as needed dose of benztropine (Cogentin) I.M. as ordered. C. administer as needed dose of benztropine (Cogentin) by mouth as ordered. D. administer as needed dose of haloperidol (Haldol) by mouth. A. take the client’s vital signs. B. explore the content of the hallucinations. C. tell him his fear is unrealistic. D. engage the client in reality-oriented activities. 45. Which medication can control the extrapyramidal effects associated with antipsychotic agents? A. take an as-needed dose of psychotropic medication whenever they hear voices. B. practice saying “Go away” or “Stop” when they hear voices. C. sing loudly to drown out the voices and provide a distraction. D. go to their room until the voices go away. 47. A dystonic reaction can be caused by which of the following medications? 48. While pacing in the hall, a client with paranoid schizophrenia runs to the nurse and says, “Why are you poisoning me? I know you work for central thought control! You can keep my thoughts. Give me back my soul!” How should the nurse respond during the early stage of the therapeutic process? 49. A client is admitted to the inpatient unit of the mental health center with a diagnosis of paranoid schizophrenia. He’s shouting that the government of France is trying to assassinate him. Which of the following responses is most appropriate? A. sit in a quiet, dark room and concentrate on the voices. B. listen to a personal stereo through headphones and sing along with the music. C. call a friend and discuss the voices and his feelings about them. D. engage in strenuous exercise. Here are the answers and rationale for this exam. Counter check your answers to those below and tell us your scores. If you have any disputes or need more clarification on a certain question, please direct them to the comments section. Option A: Seizures are the most common serious adverse effect of using flumazenil to reverse benzodiazepine overdose. The effect is magnified if the client has a combined tricyclic antidepressant and benzodiazepine overdose. Options B, C, and D: Less common adverse effects include shivering, anxiety, and chest pain. 2. Answer: C. identify anxiety-causing situations. Option C: Bulimic behavior is generally a maladaptive coping response to stress and underlying issues. The client must identify anxiety-causing situations that stimulate the bulimic behavior and then learn new ways of coping with the anxiety. Option A: Controlling shopping for large amounts of food isn’t a goal early in treatment. Option B: Managing eating impulses and replacing them with adaptive coping mechanisms can be integrated into the plan of care after initially addressing stress and underlying issues. Option D: Eating three meals per day isn’t a realistic goal early in treatment. 3. Answer: A. check the client frequently at irregular intervals throughout the night. Option A: Checking the client frequently but at irregular intervals prevents the client from predicting when observation will take place and altering behavior in a misleading way at these times. Option B: May encourage the client to try to manipulate the nurse or seek attention for having a secret suicide plan. Option C: May reinforce suicidal ideas. Option D: Decreased communication is a sign of withdrawal that may indicate the client has decided to commit suicide; the nurse shouldn’t disregard it. Option D: The antidote for acetaminophen toxicity is acetylcysteine. It enhances conversion of toxic metabolites to nontoxic metabolites. Option A: Deferoxamine mesylate is the antidote for iron intoxication. Option B: Succimer is an antidote for lead poisoning. Option C: Flumazenil reverses the sedative effects of benzodiazepines. Option D: Chlordiazepoxide (Librium) and other tranquilizers help reduce the symptoms of alcohol withdrawal. Option A: Naloxone (Narcan) is administered for narcotic overdose. Option B: Haloperidol (Haldol) may be given to treat clients with psychosis, severe agitation, or delirium. Option C: Magnesium sulfate and other anticonvulsant medications are only administered to treat seizures if they occur during withdrawal. Option D: This response acknowledges that the client is testing limits and that the nurse is setting them by performing postprandial monitoring to prevent self-induced emesis. Clients with bulimia nervosa need to feel in control of the diet because they feel they lack control over all other aspects of their lives. Option A: Because their therapeutic relationships with caregivers are less important than their need to purge, they don’t fear betraying the nurse’s trust by engaging in the activity. Option B: They commonly plot to purge and rarely share their secrets about it. Option C: An authoritarian or challenging response may trigger a power struggle between the nurse and client. Option B: Confronting the client with the consequences of substance abuse helps to break through denial. Option A: Making threats isn’t an effective way to promote self-disclosure or establish a rapport with the client. Option C: Although the nurse should encourage the client to discuss feelings, the discussion should focus on how the client felt before, not during, an episode of substance abuse. Encouraging elaboration about his experience while getting high may reinforce the abusive behavior. Option D: The client undoubtedly is aware that drug use is illegal; a reminder to this effect is unlikely to alter behavior. 8. Answer: A. The client will establish adequate daily nutritional intake. Option A: According to Maslow’s hierarchy of needs, all humans need to meet basic physiological needs first. Because a client with anorexia nervosa eats little or nothing, the nurse must first plan to help the client meet this basic, immediate physiological need. Options B, C, and D: The nurse may give lesser priority to goals that address long-term plans, self-perception, and potential complications. 9. Answer: A. The injury isn’t consistent with the history or the child’s age. Option A: When the child’s injuries are inconsistent with the history given or impossible because of the child’s age and developmental stage, the emergency department nurse should be suspicious that child abuse is occurring. Option B: The parents may tell different stories because their perception may be different regarding what happened. If they change their story when different healthcare workers ask the same question, this is a clue that child abuse may be a problem. Option C: Child abuse occurs in all socioeconomic groups. Option D: Parents may argue and be demanding because of the stress of having an injured child. 10. Answer: A. They tend to overprotect their children. Option A: Clients with anorexia nervosa typically come from a family with parents who are controlling and overprotective. These clients use eating to gain control of an aspect of their lives. Options B, C, and D: The characteristics described in options B, C, and D aren’t typical of parents of children with anorexia. Option B: The first priority is to call a security guard and another staff member. After doing this, the healthcare worker should inform the husband what is expected, speaking in concise statements and maintaining a firm but calm demeanor. This approach makes it clear that the healthcare worker is in control and may diffuse the situation until the security guard arrives. Option A: The healthcare worker who witnesses this scene must take precautions to ensure personal as well as client safety, but shouldn’t attempt to manage a physically aggressive person alone. Option C: Telling the husband to leave would probably be ineffective because of his agitated and irrational state. Option D: Exploring his anger doesn’t take precedence over safeguarding the client and staff. 12. Answer: C. Let the client choose her own food. If she eats everything she orders, then stay with her for 1 hour after each meal. Option C: Allowing the client to select her own food from the menu will help her feel some sense of control. Option A: She must then eat 100% of what she selected. Option B: Remaining with the client for at least 1 hour after eating will prevent purging. Option D: Bulimic clients should only be allowed to eat food provided by the dietary department. Option B: The nurse’s values, beliefs, and attitudes toward self-destructive behavior influence responses to a suicidal client; such responses set the overall mood for the nurse-client relationship. Therefore, the nurse initially must explore personal feelings about suicide to avoid conveying negative feelings to the client. Option C: Discussing the future and providing anticipatory guidance can help the client prepare for future stress, but this isn’t a priority. Option D: Referring the client to a clergyperson may increase the client’s trust or alleviate guilt; however, it isn’t the highest priority. 14. Answer: D. Provide objective data and feedback regarding the client’s weight and attractiveness. Option D: By focusing on reality, this strategy may help the client develop a more realistic body image and gain self-esteem. Option A: Inappropriate because discussing the client’s perceptions and feeling wouldn’t help her to identify, accept, and work through them. Option B: Focusing discussions on food and weight would give the client attention for not eating, making option B incorrect. Option C: Inappropriate because recognizing unrealistic cultural standards wouldn’t help the client establish more realistic weight goals. Option B: Disulfiram may be given to clients with chronic alcohol abuse who wish to curb impulse drinking. Disulfiram works by blocking the oxidation of alcohol, inhibiting the conversion of acetaldehyde to acetate. As acetaldehyde builds up in the blood, the client experiences noxious and uncomfortable symptoms. Even alcohol rubbed onto the skin can produce a reaction. The client receiving disulfiram must be taught to read ingredient labels carefully to avoid products containing alcohol such as aftershave lotions. 16. Answer: C. Set up a strict eating plan for the client. Option C: Establishing a consistent eating plan and monitoring the client’s weight are important for this disorder. Option A: The family should be included in the client’s care. Option B: The client should be monitored during meals — not given privacy. Option D: Exercise must be limited and supervised. Option B: Victims of domestic violence must be assessed for their readiness to leave the perpetrator and their knowledge of the resources available to them. Nurses can then provide the victims with information and options to enable them to leave when they are ready. Option A: The reasons they stay in the relationship are complex and can be explored at a later time. Option C: The use of drugs or alcohol is irrelevant. Option D: There is no evidence to suggest that previous victimization results in a person’s seeking or causing abusive relationships. 18. Answer: B. thiamine deficiency. Option B: Numbness and tingling in the hands and feet are symptoms of peripheral polyneuritis, which results from inadequate intake of vitamin B1 (thiamine) secondary to prolonged and excessive alcohol intake. Treatment includes reducing alcohol intake, correcting nutritional deficiencies through diet and vitamin supplements, and preventing such residual disabilities as foot and wrist drop. Options A, C, and D: Acetate accumulation, triglyceride buildup, and a below-normal serum potassium level are unrelated to the client’s symptoms. 19. Answer: C. The child doesn’t cry when the shoulder is examined. Option C: A characteristic behavior of abused children is lack of crying when they undergo a painful procedure or are examined by a healthcare professional. Therefore, the nurse should suspect child abuse. Options A, B, and D: Crying throughout the examination, pulling away from the physician, and not making eye contact with the nurse are normal behaviors for preschoolers. Option B: The highest priority for a client who has ingested PCP is meeting safety needs of the client as well as the staff. Drug effects are unpredictable and prolonged, and the client may lose control easily. Options A, C, and D: After safety needs have been met, the client’s physical, psychosocial, and medical needs can be met. 21. Answer: A. Accept responsibility for own behaviors. Option A: Children with oppositional defiant disorder frequently violate the rights of others. They are defiant, disobedient, and blame others for their actions. Accountability for their actions would demonstrate progress for the oppositional child. Option B: This is incorrect as the oppositional child usually focuses on his own needs. Options C and D: These aren’t outcome criteria but interventions. 22. Answer: D. Approach her slowly while speaking in a calm voice, calling her name, and telling her that the nurse is here to help her. Option D: Ensuring the safety of the client and the nurse is the priority at this time. Therefore, the nurse should approach the client cautiously while calling her name and talking to her in a calm, confident manner. The nurse should keep in mind that the client shouldn’t be startled or overwhelmed. After explaining that the nurse is there to help, the nurse should observe the client’s response carefully. Option B: If the client shows signs of agitation or confusion or poses a threat, the nurse should retreat and request assistance. Option A: The nurse shouldn’t attempt to sit next to the client or examine injuries without first announcing the nurse’s presence and assessing the dangers of the situation. Option D: A client with anorexia nervosa has an unrealistic body image that causes consumption of little or no food. Therefore, the client needs assistance with making decisions about health. Options A, B, and C: Instead of protecting the client’s health, options A, B, and C may serve to make the client defensive and more entrenched in her unrealistic body image. 24. Answer: B. alcohol withdrawal. Option B: The client’s vital signs and hallucinations suggest delirium tremens or alcohol withdrawal syndrome. Options A, C, and D: Although infection, acute sepsis, and pneumonia may arise as postoperative complications, they wouldn’t cause this client’s signs and symptoms and typically would occur later in the postoperative course. Option C: Clonidine is used as adjunctive therapy in opiate withdrawal. Option A: Benzodiazepines and neuroleptic agents are typically used to treat PCP intoxication. Option B: Benzodiazepines, such as chlordiazepoxide (Librium), and neuroleptic agents, such as haloperidol, are used to treat alcohol withdrawal. Option D: Antidepressants and medications with dopaminergic activity in the brain, such as fluoxetine (Prozac), are used to treat cocaine withdrawal. 26. Answer: C. The client keeps a journal and discusses it with the nurse. Option C: The client is moving toward meeting the goal because recording and discussing feelings is a constructive way to manage stress. Option A: Increased fluid intake may be an attempt by the client to curb her appetite and artificially increase her weight. Option B: Although physical activity can reduce stress, the anorexic client is more likely to use pacing to burn calories and lose weight. Option D: Although talks with friends can decrease stress, constant talking is more likely a way of avoiding dealing with problems. Option C: The first of the “Twelve Steps of Alcoholics Anonymous” is admitting that an individual is powerless over alcohol and that life has become unmanageable. Option A: Although Alcoholics Anonymous promotes total abstinence, a client will still be accepted if he drinks. Option B: A physician referral isn’t necessary to join. Option D: New members are assigned a support person who may be called upon when the client has the urge to drink. Option A: An adult who throws temper tantrums, such as this one, is displaying regressive behavior, or behavior that is appropriate at a younger age. Option B: In projection, the client blames someone or something other than the source. Option C: In reaction formation, the client acts in opposition to his feelings. Option D: In intellectualization, the client overuses rational explanations or abstract thinking to decrease the significance of a feeling or event. Option C: Twelve-step programs focus on recovery 1 day at a time. Option A: Such programs discourage people from claiming that they will never again use a substance because relapse is common. Option B: The belief that one may use a limited amount of an abused substance indicates denial. Option D: Substituting one abused substance for another predisposes the client to cross-addiction. 30. Answer: B. underestimate the amount consumed. Option B: Most people who abuse substances underestimate their consumption in an attempt to conform to social norms or protect themselves. Options A, C, and D: Few accurately describe or overestimate consumption; some may deny it. Therefore, on admission, quantitative and qualitative toxicology screens are done to validate information obtained from the client. Option C: Frequent vomiting causes tenderness and swelling of the parotid glands. Options A and B: The reduced metabolism that occurs with severe weight loss produces bradycardia and cold extremities. Option D: Soft, downlike hair (called lanugo) may cover the extremities, shoulders, and face of an anorexic client. 32. Answer: D. perceptual disorders. Option D: Perceptual disorders, especially frightening visual hallucinations, are very common with alcohol withdrawal. Option A: Coma isn’t an immediate consequence. Option B: Manipulative behaviors are part of the alcoholic client’s personality but aren’t signs of alcohol withdrawal. Option C: Suppression is a conscious effort to conceal unacceptable thoughts, feelings, impulses, or acts and serves as a coping mechanism for most alcoholics. Option D: A client with an eating disorder will normally exercise to excess in an effort to burn as many calories as possible. Option A: The client will usually wear loose-fitting clothing to hide what she considers to be a fat body. Options B and C: Skin and nails become dry and brittle and blood pressure and body temperature drop from excessive weight loss. Option D: The symptoms listed are specific to opioid withdrawal. Option A: Alcohol withdrawal would show elevated vital signs. Option B: There is no real withdrawal from cannabis. Option C: Symptoms of cocaine withdrawal include depression, anxiety, and agitation. 35. Answer: B. Establish a trusting relationship with the client. Option B: A client with an eating disorder may be secretive and unwilling to admit that a problem exists. Therefore, the nurse first must establish a trusting relationship to elicit the client’s feelings and thoughts. Option A: The anorexic client may spend long hours discussing nutrition or handling and preparing food in an effort to stall or avoid eating food; the nurse shouldn’t reinforce her preoccupation with food. role in anorexia nervosa, discussing these factors isn’t the first action the nurse should take. Option D: Exploring the reasons why the client doesn’t eat would increase her emotional investment in food and eating. 36. Answer: A. tension and irritability. Option A: An amphetamine is a nervous system stimulant that is subject to abuse because of its ability to produce wakefulness and euphoria. An overdose increases tension and irritability. Options B and C: These are incorrect because amphetamines stimulate norepinephrine, which increases the heart rate and blood flow. Option D: Diarrhea is a common adverse effect, so option D is incorrect. Option C: Both benzodiazepines, such as alprazolam, and barbiturates, such as phenobarbital, are addictive, controlled substances. Options A, B, and D: All the other drugs listed aren’t addictive substances. Option A: Studies of those who commit suicide reveal the following high-risk groups: adolescents; men over age 45; persons who have made previous suicide attempts. Although more women attempt suicide than men, they typically choose less lethal means and therefore are less likely to succeed in their attempts. Options B, C, and D: Divorced, widowed, and separated persons; professionals, such as physicians, dentists, and attorneys; students; unemployed persons; persons who are depressed, delusional, or hallucinating; alcohol or substance abusers; and persons who live in urban areas are also at risk. 39. Answer: B. palilalia. Palilalia is defined as the repetition of sounds and words. Option A: Echolalia is the act of repeating the words of others. Option C: Apraxia is the inability to carry out motor activities. 40. Answer: A. unpredictable behavior and intense interpersonal relationships. Option A: A client with borderline personality disorder displays a pervasive pattern of unpredictable behavior, mood, and self-image. Interpersonal relationships may be intense and unstable and behavior may be inappropriate and impulsive. Option B: Although the client’s impaired ability to form relationships may affect parenting skills, inability to function as a responsible parent is more typical of antisocial personality disorder. Option C: Somatic symptoms characterize avoidant personality disorder. Option D: Coldness, detachment, and lack of tender feelings typify schizoid and schizotypal personality disorders. Option A: Disorganized-type schizophrenia (formerly called hebephrenia) is characterized by extreme social impairment, marked inappropriate affect, silliness, grimacing, posturing, and fragmented delusions and hallucinations. Option B: A client with a paranoid disorder typically exhibits suspicious delusions, such as a belief that evil forces are after him. Option D: Elevated affect is associated with schizoaffective disorder. 42. Answer: C. Call the physician to clarify the order because the dosage is too high. Option C: The dosage is too high (normal dosage ranges from 5 to 10 mg daily). Options A and B: May lead to an overdose. Option D: This is incorrect because haloperidol helps with symptoms of hallucinations. 43. Answer: B. administer as needed dose of benztropine (Cogentin) I.M. as ordered. Option B: The client is most likely suffering from muscle rigidity due to haloperidol. I.M. benztropine should be administered to prevent asphyxia or aspiration. Option A: Lorazepam treats anxiety, not extrapyramidal effects. Another dose of haloperidol would increase the severity of the reaction. 44. Answer: B. explore the content of the hallucinations. Option B: Exploring the content of the hallucinations will help the nurse understand the client’s perspective on the situation. Option A: The client shouldn’t be touched, such as in taking vital signs, without telling him exactly what is going to happen. Option C: Debating with the client about his emotions isn’t therapeutic. Option D: When the client is calm, engage him in reality-based activities. Option C: Amantadine is an anticholinergic drug used to relieve drug-induced extrapyramidal adverse effects, such as muscle weakness, involuntary muscle movement, pseudo-parkinsonism, and tardive dyskinesia. Other anticholinergic agents used to control extrapyramidal reactions include benztropine mesylate (Cogentin), trihexyphenidyl (Artane), biperiden (Akineton), and diphenhydramine (Benadryl). Options A, B, and D: Perphenazine is an antipsychotic agent; doxepin, an antidepressant; and clorazepate, an antianxiety agent. Because these medications have no anticholinergic or neurotransmitter effects, they don’t alleviate extrapyramidal reactions. 46. Answer: B. practice saying “Go away” or “Stop” when they hear voices. Option B: Researchers have found that some clients can learn to control bothersome hallucinations by telling the voices to go away or stop. Option A: Taking an as needed dose of psychotropic medication whenever the voices arise may lead to overmedication and put the client at risk for adverse effects. Because the voices aren’t likely to go away permanently, the client must learn to deal with the hallucinations without relying on drugs. Option C: Although distraction is helpful, singing loudly may upset other clients and would be socially unacceptable after the client is discharged. Option D: Hallucinations are most bothersome in a quiet environment when the client is alone, so sending the client to his room would increase, rather than decrease, the hallucinations. Option B: Haloperidol is a phenothiazine and is capable of causing dystonic reactions. Options A and D: Diazepam and clonazepam are benzodiazepines, and amitriptyline is a tricyclic antidepressant. Benzodiazepines don’t cause dystonic reactions; however, they can cause drowsiness, lethargy, and hypotension. Option C: Tricyclic antidepressants rarely cause severe dystonic reactions; however, they can cause a decreased level of consciousness, tachycardia, dry mouth, and dilated pupils. Option B: The nurse should directly orient a delusional client to reality, especially to place and person. Options A and C: These may encourage further delusions by denying poisoning and offering information related to the delusion. Option D: Validating the client’s feelings occurs during a later stage in the therapeutic process. Option B: Responses should focus on reality while acknowledging the client’s feelings. Option A: Arguing with the client or denying his belief isn’t therapeutic. Option C: Arguing can also inhibit the development of a trusting relationship. Continuing to talk about delusions may aggravate the psychosis. Option D: Asking the client if a foreign government is trying to kill him may increase his anxiety level and can reinforce his delusions. 50. Answer: B. listen to a personal stereo through headphones and sing along with the music. Option B: Increasing the amount of auditory stimulation, such as by listening to music through headphones, may make it easier for the client to focus on external sounds and ignore internal sounds from auditory hallucinations. Option A: This would make it harder for the client to ignore the hallucinations. Option C: Talking about the voices would encourage the client to focus on them. Option D: This is incorrect because exercise alone wouldn’t provide enough auditory stimulation to drown out the voices.